8.EE.7 - Solve Linear Equations - Solve linear equations in one variable. Give examples of linear equations in one variable with one solution, infinitely many solution or no solutions. Solve linear equations with rational number coefficients, including equations whose solutions require expending expressions using the distributive property and collecting like terms. Thanks to the website Chilimath.com, we can see some example problems to the right. You can check them out to see if you follow what to do. There are 5 problems to check out, so advance through them to see each one. If you think you need a little more help, just scroll down and watch the couple of videos that we have lower on the page. This first video shows how to solve single-step equations, which are equations where you need to do only one thing to find the answer. This second video shows how to handle problems that involve the distributive property. It builds upon the first video. Click here to review how to distribute. 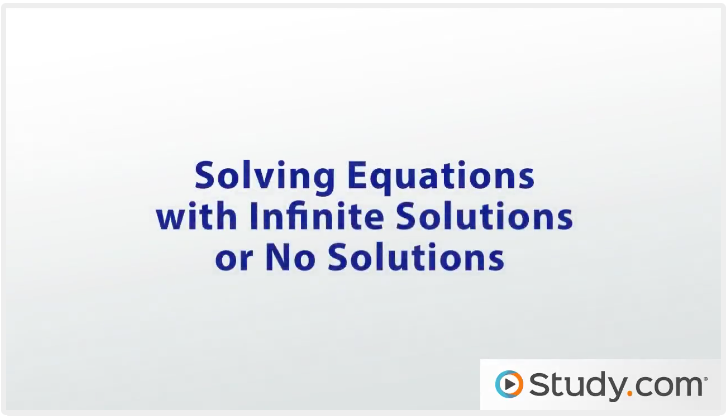 This third video talks about what would happen if your equation had no solution or infinite solutions. Thanks to mathplayground.com, where I got this practice. You can visit their site at mathplayground.com/algebraequations to see more practice.